If you were asked about one of your happiest moments in teaching, there’s a good chance that your answer would be something like, “that moment when I see the light go on,” or, “those times when I see a student make a new connection, discovering something about the world around them or mastering a challenging skill.” Our passion for learning has taught us that these are precious and magnificent moments of growth. We feel deep satisfaction when we help our students to thrive. What does thriving mean for students (and teachers) in the 21st century? There isn’t a one-size-fits-all answer to this question. However, there are fascinating developments from happiness studies that provide some guideposts and intriguing possibilities for teachers. Sustainable happiness— taking happiness and well-being to the next level. If the relevance of happiness to education hasn’t been a burning question for you, you’re not alone. Educators are just beginning to explore this. Yet, we all know that when students are happy and engaged they learn well; that stress inhibits learning. We also know that a toxic learning environment is soul-crushing for teachers and students. Research on happiness and well-being has been spearheaded by positive psychologists. They are investigating people and institutions that flourish, asking questions such as: What can we learn from happy people? What are the benefits of happiness? Can happiness skills be taught? The great news for educators is that happiness skills can indeed be taught. The connections between happiness, health and well-being are groundbreaking. Happy people tend to live longer. Positive emotions are also associated with lower blood pressure and reduced risk of heart disease. Happiness is more than just a good feeling! Happy people tend to be resilient, generous, appreciative, empathetic, have healthy relationships, and may also be inclined to engage in environmentally friendly behaviours. Of course, they aren’t happy all the time. Their resilience comes, in part, from having the capacity to experience a full range of emotions. For example, happy people are able to encounter life’s challenges, even severe trauma, and choose personal growth rather than becoming stuck. They also take the time to discover what makes their heart sing, and integrate their passions into their lifestyle and work whenever possible. When I began to delve into the happiness research years ago, my mind was alive with possibilities and implications for education. At the same time, I wondered, what kind of happiness are we talking about? As an educator, I also queried “who, or what is teaching us about happiness?” and “what are we learning?” It turns out that the kind of happiness that leads to positive health outcomes is “authentic happiness,” which is nurtured through valuing relationships, being engaged in our community or work, or feeling that our life has meaning and purpose. Contrary to most advertising and mass media, we aren’t happier if we have a bigger house or car than our neighbour. In fact, comparing ourselves to others and getting caught in these external measures of success is likely to lead to dissatisfaction with our lives rather than the enduring experience of contentment that is associated with happiness. 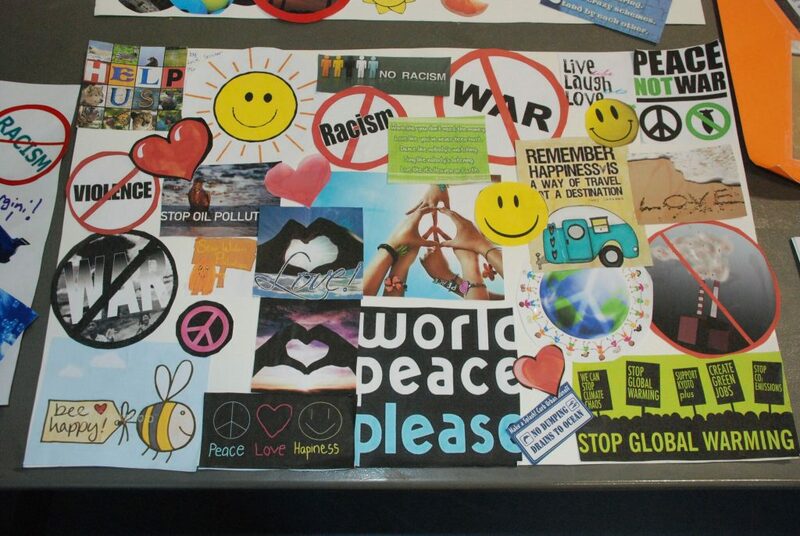 Collages created by grade seven students Megan Bierman-Brophy and Lucie Soicher at Kingsway College School, Etobicoke, ON when asked about their view of sustainable happiness. It captivated me to contemplate the link between happiness studies and the area of sustainability, because our happiness doesn’t exist in isolation from other people or the natural environment. Every day, our life touches and is touched by other people, other species and the natural environment through our daily encounters, the clothes we wear, the food we eat, how we travel, and even the materials that provide us shelter. I felt that we needed a new concept that captured this interdependence. Could such a concept offset the media messages that urge hyperconsumption? Could we imagine taking our pursuit of happiness and wellbeing to a new level? Sustainable happiness is happiness that contributes to individual, community, and/or global well-being and does not exploit other people, the environment or future generations. These ideas led to the development of something that makes my heart sing – “sustainable happiness.” In a nutshell, sustainable happiness is about everyone and everything thriving. Over the last six years, I’ve shared this concept with teachers and students at Cape Breton University and elementary schools across Canada, and the process has been deeply gratifying. I’ve had the pleasure of creating a resource guide that links sustainable happiness with health education outcomes for every province for students in kindergarten through to grade six. It is available in French and English at no cost from www.sustainablehappiness.ca. Happy, resilient teachers are more effective educators. 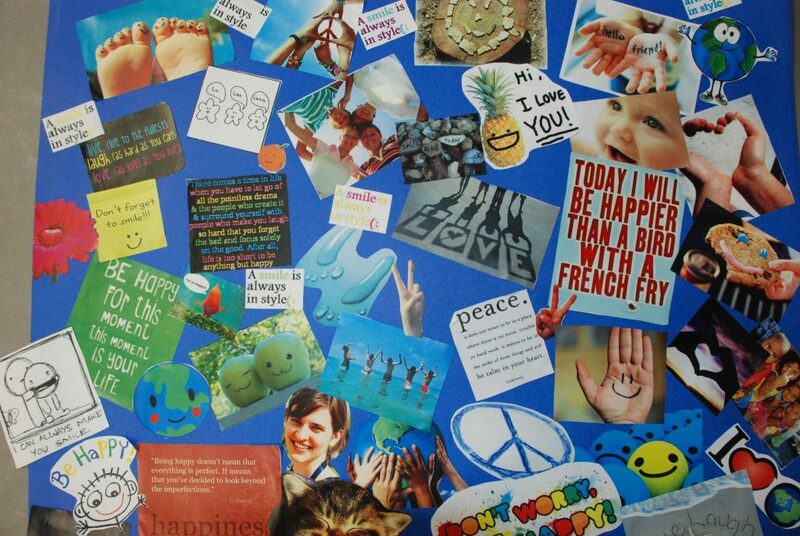 Tapping into the wellspring of happiness studies can enhance your own well-being and spill over into creative applications for your classroom. You can start your own journey towards sustainable happiness by creating a “Bliss List” – write down some activities that make your heart sing. How often do you engage in these activities? Are there some that you wish to do more frequently? Some teachers find it helpful to post their Bliss List on the fridge, because it reminds them to set aside time to take care of themselves. Happiness research claims that gratitude letters can enhance well-being, and expressing gratitude and appreciation can have remarkable effects on your health. To be honest, I was skeptical of these assertions at first. But every year my university students tell me that writing a gratitude letter is one of the best activities they have ever done. Some people like writing things down and find that keeping a Gratitude Journal helps them to appreciate the people and world around them. Others prefer creating songs or artwork that reflects their appreciation. In my experience, taking a few moments each day to consider aspects of my life that bring genuine wealth enhances my well-being. I bring my attention to things that could easily be taken for granted—breathing, the ability to walk, my senses, easy access to clean water, a beautiful environment, a trusting neighbourhood, wonderful friends and family, and the list goes on! 1) Students will understand that expressing gratitude contributes to their well-being and the well-being of others. 2) Students will express gratitude to someone or about something. Invite students to suggest how people show that they are grateful or appreciative. Ask what if feels like to express gratitude and to experience it. Assist students to realize that this is a readily accessible source of positive well-being that they can choose to experience. Ask students to think of someone (or something) they appreciate. This may be done best with their eyes closed. Guide them to think about all the reasons why they are grateful to that person or appreciate the thing (perhaps an animal) they have in mind. Ask them to consider how they would like to express their gratitude or appreciation. It may be a card, a song, a poem, a picture, a sculpture, etc. They may also want to do something for that person/pet or spend time with them. 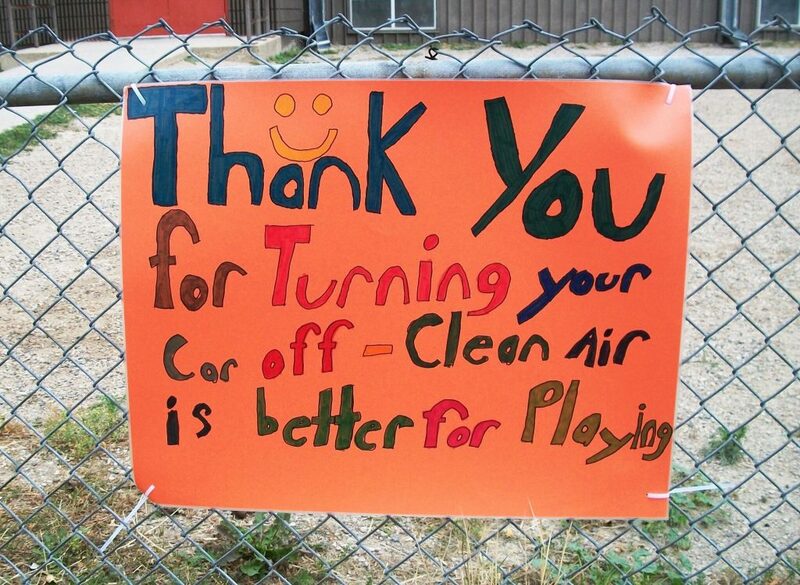 This could be encouraged as an addition to making something that expresses their gratitude or appreciation. 1. Students will explore the concept of happiness and what it means to different people. 2. Students will discover that for most people happiness comes from relationships with family and friends, being involved in the community, meaningful work, feeling connected to other people or the natural environment, spiritual beliefs (and is associated less often with material possessions). 1) What contributes most to your experience of happiness? 2) What lessons have you learned about happiness through the tough times in your life? 3) What advice do you have for my generation about having a happy life? Once the interviews are complete, prepare four large pieces of paper (or four columns on a white/blackboard). Each page should include one of the above questions. The fourth page is for other questions that the students asked. Students can use point form to summarize the answers they received for each question. Once the chart is completed by each student, review the answers with the class. Ask the class to point out similarities and differences. What are some of the key lessons from this? Do they agree with the advice that has been given? How does the interview information compare with the information that the media gives us about happiness? Excerpts from: Sustainable Happiness and Health Education- Teacher’s Guide, O’Brien, C. 2010. Available at no cost: www.sustainablehappiness.ca. Happiness is at the heart of who we are. Incorporating sustainable happiness into our lifestyle, classroom and school can inspire us to leave a legacy of sustainable happiness—a happiness footprint that contributes to the well-being of other people, other species and the natural environment. 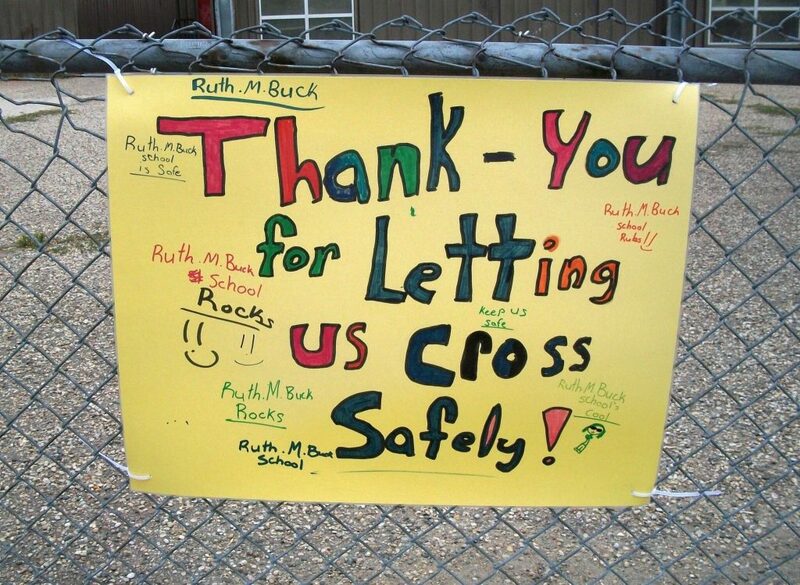 “Thank-you” posters that students at Ruth M. Buck School in Regina created as part of an active school travel project. Sustainable happiness is a component of the project. Photos by: Tracey Briggs, School Travel Planning Coordinator with Saskatchewan in motion. Catherine O’Brien is an education professor at Cape Breton University, Nova Scotia. She developed the world’s first university course on sustainable happiness. Her “Sustainable Happiness and Health, Teacher’s Guide” is being used by educators in Canada and other countries.